Now our airline does not comply with scheduled passenger services. 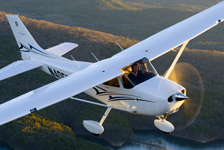 Charter flight is very convenient and fast way to reach any point of the world, not wasting so precious time in countries, connected with changes of flights, aircraft and other discomforts. 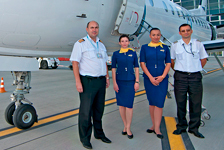 Air Company «URGA» proposes services of individual flights organization. In our Company you can order both passenger and cargo aircraft, fully meeting your needs not only in terms of comfort and seat capacity, but also in planning the budget for travel. If you have any questions, our managers are willing to help the customer at any time. Our Air Company will help you in organizing, escorting and providing passenger charter flights at AN-24 and Saab-340B aircraft types. Your baggage will be always with you and will never be lost. 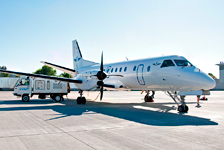 Cargo transportations with IJSAC «URGA» are transportations of cargo by means of charter flights to any airport at any time and they have the range of advantages over other types of cargo delivery. First comes high efficiency of cargo delivery, particularly if it is international transportation. Indeed, if we compare all types of vehicles used to transport cargo, the plane is the fastest one. Secondly, air cargo transportation presupposes high level of safety o9f the delivered cargo, because during the transportation it can’t be damaged, or spoiled. Besides the stowage of cargo at needed flight carriers accept responsibility for freight forwarding, organizing temporary storage and insurance, if necessary, perform the customs declaration of goods. IJSAC «URGA» offers charter flights for cargo that weights not more than 5,5 t and has volume not more than 60×3 m. AN-26B aircraft has volumetric cargo compartment and opening cargo ramp for providing the most comfortable loading/unloading of cargo. Trusting cargo to IJSAC «URGA» you can be sure that your cargo will be delivered in time and in the proper place. Transportation of children only with providing a separate seat. Children of 5 (five) years and above are allowed for transportation (certificate of birth is required). Children under 12 years are allowed transportation only accompanied by adults. Discounts for children and welfare beneficiaries are not applicable.